When it comes to girls we all want something that is latest and stylish because we all want to look good and stand out differently from the rest of the crowd. If you have desires like such then we have the best thing to offer you which will not only make you look different but in fact, everyone will make you the center of attention because this Abbey Clancy Leather Jacket is the top trendy Jacket these days. The Black Shiny outer appearance adds more charm to it. 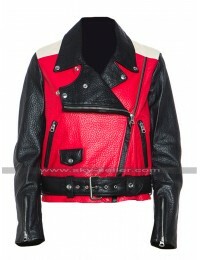 The quality is remarkable because it comes in faux and genuine leather. 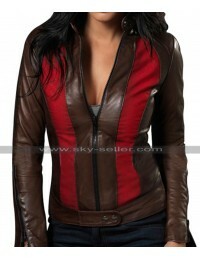 It is a Short Jacket which comes in a slim fit with front silver zipper closure and full-length body fitted sleeves. It has a shirt collar with a silver button attached which adds a design to it. we have this Quilted Shoulders Jacket at a reasonable price therefore if you are willing to purchase this then order away as there is a very high demand for this classy jacket.